Pioneer N-70A review | What Hi-Fi? Pioneer’s flagship streamer comes into the market knowing full well the mammoth task at hand: compete with the pace-setting entries from Naim and Cyrus. The N-70A’s little brother, the £500 N-50A, has already distinguished itself in our eyes so the pressure is on. Physically, the N-70A gains 2cm in height over its cheaper sibling (to 12cm), and expands the aluminium front to the side panels also. With the extra bulk, it looks like a machine that would last a lifetime. Our sample is black, but a silver finish is also available. The front panel – featuring a high-contrast 3.5in LCD screen and basic button layout – includes a 6.3mm headphone output, driven by a dedicated amp and accompanied by a small volume knob. Great if your amplifier doesn’t have one, or it’s not very good. 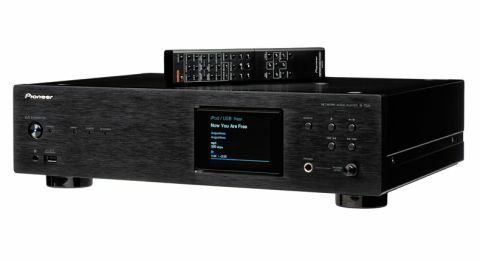 The N-70A can stream and upsample PCM files up to 32-bit/384kHz (and play DSD 5.6MHz) over a wired connection to your home network. A wireless pairing can be achieved by forking out £50 for the separate adapter. As well as the customary RCA outs, balanced outputs are also onboard for hooking the streamer up to your amplifier. When it comes to compatibility, the N-70A leaves no stone unturned. To complement web-based streaming – Spotify Connect, and internet radio courtesy of vTuner – there’s AirPlay functionality for streaming songs from iDevices, as well as DLNA support so you can stream networked music from your computer or NAS drive. In terms of connections, the N-70A is more than adequate. An asynchronous USB (Type-B) caters for a computer hook-up and features the same impressive 32-bit/384kHz PLCM and 5.6MHz DSD support. The front and rear USB (Type-A) inputs can play anything from MP3s to WAV and FLAC files up to 24-bit/192kHz, though bear in mind Apple Lossless files are limited to 24-bit/96kHz. Around the back are single optical and coaxial inputs, too. All your music is controllable to your heart’s content with Pioneer’s intuitive, responsive ControlApp (free, Android and iOS) or the familiar lanky, well featured remote. Pioneer has gone to great lengths to make headway with performance, too. As with some of Pioneer’s other flagship products (the BDP-LX88 Blu-ray payer, for example) the unit’s interior is divided into three chambers to isolate the components. This is designed to reduce signal interference, which inherently degrades sound quality. Those who enjoy fiddling with sound modes can get stuck into ‘Up-sampling’ (which increases the sampling frequency of the source material to 384kHz internally) and ‘Hi-bit32 audio processing’ (which processes the signal in 32bit). Essentially, attempting to turn an audio file into 'high-res'. They are hard to recommend, though; the sound gains detail but feels artificial and dynamics are less apparent. ‘Auto Sound Retriever’ is for highly compressed files, but we found it affects higher-quality files, too, making the delivery muggy and less clear. We’d leave the out-of-the-box ‘Direct’ mode on for optimum performance. Pioneer gets 10/10 for consistency. The N-70A has a very similar character to the N-50A: solid, full-bodied and tonally balanced with admirable dynamic insight and rhythmic drive. But here the sound is bigger and more powerful, authoritative and detailed. That gives it an impressive scorecard, even at this price, and its audience a thrilling listen. The Pioneer’s weighty disposition is a godsend in heavy sets where meaty electrics crave infinite power and muscle from your system. Play David Bowie’s Moonage Daydream, and the Pioneer sounds as muscular as it looks. It drives the song’s rhythms with remarkable punch and dynamism, steamrolling through the agile guitar melodies and applying control and restraint where necessary. There’s a sense of power and authority in everything from the leading piano and guitars, to the terse and snappy bassline. The soundstage is wonderfully encompassing and nicely tight-knit as Bowie’s echoed vocals bounce between the speakers. It could do with more space, though; the Cyrus Stream Xa’s open and airy presentation has more room for instruments to work in, and better communicates depth and dimension. That said, the Pioneer has no problem projecting Johnny Cash’s distinctly deep, quivering vocals with enough clarity, focus and insight to send a shudder down your spine. It’s a confident, convincing delivery on the whole, and that doesn’t change as we play our computer’s music library through the asynchronous USB. The headphone amp pulls its weight, too, so listening through cans is just as satisfying. Again, the presentation lacks openness – and isn’t the last word in refinement or finesse – but its insightful, driven and musical delivery is thoroughly entertaining. In terms of partnering headphones, a good start would be the Shure SRH1540s (£470), or even the open-backed Grado SR325es (£300) – perfect for when the family is out. The Pioneer N-70A is a worthy flagship that builds on its sibling’s feature count and injects greater doses of detail, power and authority into performance. Like the N-50A, everything from build to design and usability works in its favour. It’s a perfectly good machine and a serious contender. Nevertheless, in the rarified atmosphere where £1000+ music streamers live, the Cyrus Stream Xa sets the sonic bar just outside the Pioneer’s reach. It offers more precision, space and detail.